Increased oil and gas production activity and associated industrial development, as well as rapid expansion in the construction and packaging industries have contributed significantly to the rise in demand for molded plastic products. Collaboration with multinational players has helped plastic converters develop molded plastics that comply with world-class quality requirements and over the decades, plastics have replaced key materials such as metals, glass, and paper to become an integral part of our everyday life. The global molded plastics market was valued at US$124.8 bn in 2015 and is projected to reach US$202.2 bn by 2024 at a CAGR of 5.6% therein. In terms of volume, the market is expected expand at a 4.3% CAGR from 2016 to 2024. Molded plastics find application in various end-use industries, including packaging, consumables and electronics, automotive and transportation, and building and construction. The packaging application leads the molded plastics market in terms of volume as well as value. This industry is anticipated to remain the most prominent consumer of molded plastics during the forecast period, with the consumption volume amounting to almost 30% more than any other application. The price of molded plastics used for packaging has been slightly higher than that for any other application and this is also contributing to the growth of the packaging segment by value. The commercialization of advanced polymers is supporting the demand for molded plastics in the building and construction sector. Transparency Market Research has observed that molded plastic products used for building and construction have been witnessing increased growth and the emerging markets in Asia Pacific are significant contributors to this growth. Geographically, the molded plastics market has been segmented into five regions: North America, Asia Pacific, Europe, the Middle East and Africa, and Latin America. Asia Pacific, with countries such as India and China, led the global molded plastics market by volume, and is anticipated to account for a share of 49% by the end of 2016. This is followed by Europe and North America and the total revenue in these two regions together will constitute around 29% of the total market value by 2016 end. Asia Pacific is expected to remain the most attractive region for the molded plastics market given that more than half the global population and emerging markets are in Asia Pacific. As a result, international players have increased their focus on the region. The Middle East and Africa is a fast-growing region, with the GCC leading the market for molded plastics in terms of volume. This regional market is anticipated to expand at a CAGR of 6.5% between 2016 and 2024. Companies such as SABIC in Saudi Arabia are rapidly increasing their capacity for polypropylene, polyethylene, and other polymers to take advantage of untapped avenues. The markets for molded plastics in North America and Europe are rather mature and provide limited opportunities in terms of untapped potential. However, the CIS region in Europe is a bright spot where the molded plastics market is expected to expand at a faster pace than in other parts of the region. Key players in the molded plastics market include BASF SE, Eastman Chemical Company, SABIC, Huntsman Corporation, LyondellBasell Industries N.V., INEOS Group AG, Chevron Phillips Chemical Company LLC, Reliance Industries Limited, Harwal Group, Al Watania Plastics, Obeikan Investment Group (OIG), and Takween Advanced Industries. This research study analyzes the market for molded plastics in terms of revenue (US$ Bn). The molded plastics market has been segmented on the basis of material, molding technology, end use applications, and geography. The geographical segmentation includes regions which are further divided into 20countries –in the global molded plastics market. The report features a detailed regional segmentation with market growth forecasts for the 2016−2024 period. For the research, 2015 has been considered as the base year and 2016 is estimated year, while all forecasts have been given for the period from 2016 to 2024. Market data for all the segments has been provided at the regional and country-specific levelsfrom2016 to 2024. The report provides a broad competitive analysis of companies engaged in the development of molded plastics technologies for the molded plastics business. The report also includes key market dynamics such as the drivers, restraints, and opportunities affecting the global molded plastics market. These market dynamics are analyzed in detail and are illustrated in the report with the help of supporting graphs and tables. The report also provides a comprehensive analysis of the market with the help of the Porter’s Five Forces Analysis model, which helps in understanding the five major forces that affect the structure and profitability of the global molded plastics market. The forces analyzed are the bargaining power of buyers, the bargaining power of suppliers, the threat of new entrants, the threat of substitutes, and the degree of competition. The high-level analysis in the report provides detailed insights into the molded plastics business globally. There are currently numerous drivers for the market. The most prominent drivers include rapid growth in the packaging industry, decrease in oil prices along with technological advancements in plastic molding technologies. Lower oil prices help petrochemical companies improve margins, and it is becoming apparent that the profit margins of many of the petrochemical companies have improved quite considerably due to low oil prices boosting the demand for molded plastics. Market attractiveness analysis was carried out for the molded plasticsmarket on the basis of material, technology, application, region, and country. Market attractiveness was estimated on the basis of common parameters that directly impact the market. On the basis of material, the market has been segmented into polypropylene, polyethylene, polyvinyl chloride, polystyrene, polyethylene terephthalate (preforms), polyethylene terephthalate (others), and others. By molding technology the market has been segmented into injection molding, blow molding, thermoforming, and others (rotomolding andcasting). 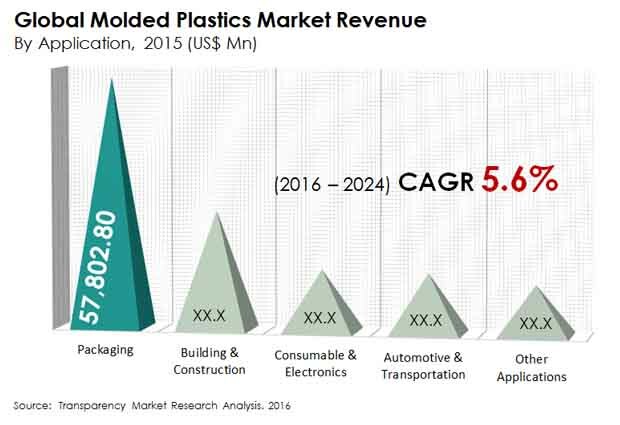 Furthermore, the molded plastics market has been segmented by various end-use applications, including packaging, consumables& electronics, automotive & transportation, building & construction, and other applications. Growth in PET preform volume is due to high demand in the packaging of food &beverage. The market value for PET preforms is expected to expand at a CAGR of 8.6% between 2016 and 2024.The two major polymers, polypropylene and polyethylene terephthalate, are expected to constitute over 50% of the total molded plastics market share. India is one of the fastest-growing economies in the world. Favorable government regulations and emergence of medium and small enterprises in India have contributed significantly to the molded plastics market. Key players in the molded plasticsmarket areBASF SE, Eastman Chemical Company, SABIC, Huntsman Corporation, LyondellBasell Industries N.V., INEOS Group AG, Chevron Phillips Chemical Company LLC, Reliance Industries Limited, Harwal Group, Al Watania Plastics, Obeikan Investment Group (OIG), and Takween Advanced Industries. The report provides an overview of these companies, followed by their financial details, business strategies, and recent developments.